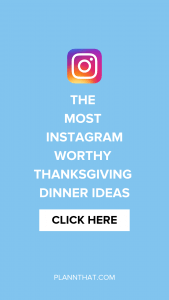 If you are ready to drool your face off at some Instagram-worthy Thanksgiving dinner recipes… you’ve come to the right side of the interwebs. Oh, freaking out a little? Maybe it’s the first time you’re in charge? Desperately typing in “How to Cook Thanksgiving Dinner” on YouTube to find tutorials? Don’t worry, we can squish that worry wart right now! Today I’m going to walk you down thanksgiving lane and share with your some of the most visually stunning Thanksgiving recipes worth feasting on this time of year. Pull on some sweatpants and get ready to bake up a storm! Okay okay… I know we all want to have the most delicious and probably not the healthiest foods on Thanksgiving… buuuuuut… here’s an idea. Have a little side of healthy string beans at Thanksgiving. Y’know, so you can tell the ‘gram that you had a ‘healthy’ Thanksgiving feast this year. PSST –> Want to know how to promote your Christmas Gift Ideas on Instagram? Want to impress your family this year? Here’s an Instagram-worthy recipe bound to create the best stuffing for Thanksgiving dinner possible. Oh, and don’t forget to make sure you have something to stuff with the stuffing! Turkey, bread rolls, all that jazz. Have them on hand for this Thanksgiving to make sure you don’t have a riot at the dinner table. DON’T FORGET THE THANKSGIVING DRINKS! There’s nothing worse than being reeaaaally thirsty at the dinner table, mid-meal, and not having anything delicious to quench your thirst. Don’t let that be your guests this Thanksgiving! Instead, wow their taste buds with this oh-so Instagrammable punch recipe. Looking for something that is truly jaw-dropping? Well, this Instagram-worthy thanksgiving recipe is no different. Grab out a notepad and pen and start writing down what you’ll need for your grocery shopping… because with thanksgiving? You need A LOT of groceries. Now it’s time to come up with a dish that is sweet, hot, and oh-so-impressive. I forgot to mention – this one is worth an Instagram photo or two as well! PHWAOOR! If you’ve never tried the combination of yams, maple syrup, marshmallows and pecan pies… well, quite frankly, you’re missing out on heaven in your mouth. Whip one of these up and you’ll know what a unicorn tastes like. It’s Fall, so it’s 1000% ESSENTIAL that something you make for Thanksgiving dinner includes pumpkin. Here’s an awesome recipe for cute mini pumpkin pies that are sure to go down a treat this Thanksgiving. And the best bit? If everyone is feeling a bit stuffed already, they’re easy enough to pop in a container and give to your guests to take home. Thanksgiving dinner 2018 will live on! Hurrah!